The success of the Model 3 helped to increase European sales of full-electric vehicles by 92 percent in February. The Tesla Model 3 full-electric car was Europe's best-selling premium midsize sedan in its first full month of sales, outselling sedans such as the Mercedes-Benz C class from German premium automakers. Tesla sold 3,630 Model 3 cars in the region in February, according to data from JATO Dynamics market researchers. Among the Model 3's internal combustion engine rivals, the Mercedes C-class sedan was closest with 3,420 sales. Audi sold 1,710 units of its A4 sedan and BMW sold 1,700 units of the 3 series. The numbers are for sedan sales only and are extrapolated from JATO data. If body styles such as station wagons are included, the German midsize models outsold the Model 3. The popularity of wagons in Europe mean sedans only account for a quarter of 3-series and A4 sales, and a third of C-class sales, according to JATO data. The Model 3 outsold the Alfa Romeo Giulia, the Jaguar XE and the Lexus IS, which are only available as sedans. The Model 3 was also the top-selling full-electric car in Europe in February, outselling the Renault Zoe small hatchback, which sold 2,884 units and the Nissan Leaf with 2,333 sales, according to JATO data. The Model 3's early success puts further pressure on European premium brands after Tesla's Model S sedan was Europe's top-selling upper-premium sedan last year and in 2017. Tesla sold 16,508 units of the Model S in the region in 2018, outselling the top three nearest rivals: the Mercedes S class with 12,079 sales; the BMW 7 series with 9,575 sales; and the Porsche Panamera with 9,515 sales. The Model 3 will soon face increased competition from German premium brands as they launch their new long-range full-electric cars. The cheapest Model 3 sedan costs 53,800 euros ($60,400) in Germany with twin engine, four-wheel drive and a long-range battery pack rated to give a range of 537km (334 miles), according to Tesla's website. The price includes local incentives. The Performance version of the same car costs 64,600 euros. A cheaper car with a smaller battery will be available late summer/early autumn, Tesla CEO Elon Musk said in March. The success of the Model 3 helped to increase European sales of full-electric vehicles by 92 percent to 20,000 in February, JATO said. "The performance of the Model 3 is remarkable, given we normally don't see this kind of result until four or five months after a new car has hit the roads," said Felipe Munoz, JATO global analyst. 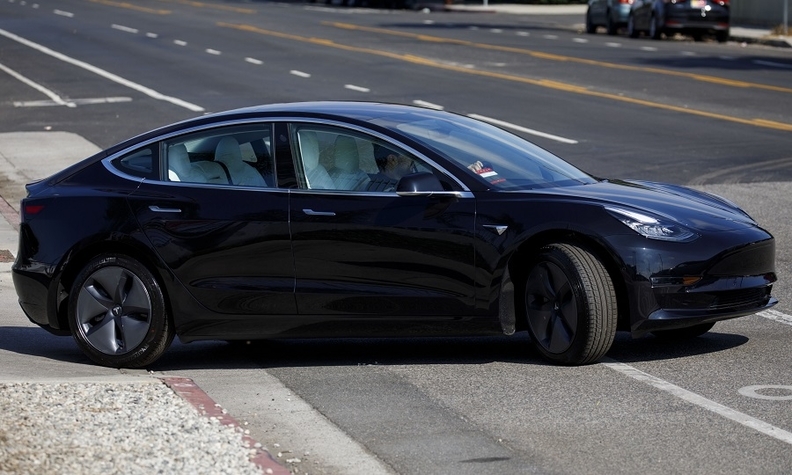 Tesla will next year start sales of the Model Y crossover version of the Model 3 in the U.S. Higher-end versions will be delivered starting in autumn 2020, while a standard version will be available in spring 2021, Tesla has said. Tesla will start to build Model Y cars to export to Europe in early 2021, Tesla said. In Germany, the Model Y will start at 56,000 euros for the rear-wheel drive car with the long-range battery, Tesla said on its website. The dual-motor version will cost 60,000 euros, while the Performance model of that car will cost 68,000 euros. Demand for SUVs is still growing in Europe and in February SUVs took almost 37 percent of all sales, JATO said. SUVs, light commercial vans and sports cars were the only segments to grow in February, it said.